Jeremies 2v8 Els sacerdots no han dit: On és Jahveh? 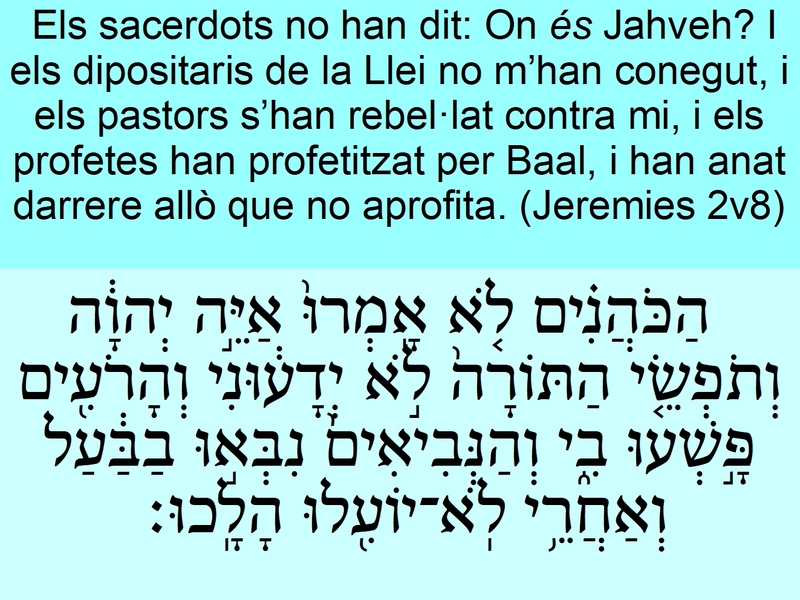 I els dipositaris de la Llei no m’han conegut, i els pastors s’han rebel·lat contra mi, i els profetes han profetitzat per Baal, i han anat darrere allò que no aprofita.הַכֹּהֲנִ֗ים לֹ֤א אָֽמְרוּ֙ אַיֵּ֣ה יְהוָ֔ה וְתֹפְשֵׂ֤י הַתּוֹרָה֙ לֹ֣א יְדָע֔וּנִי וְהָרֹעִ֖ים פָּ֣שְׁעוּ בִ֑י וְהַנְּבִיאִים֙ נִבְּא֣וּ בַבַּ֔עַל וְאַחֲרֵ֥י לֹֽא־יוֹעִ֖לוּ הָלָֽכוּ׃The priests <03548> said <0559> (08804) not, Where is the LORD <03068>? and they that handle <08610> (08802) the law <08451> knew <03045> (08804) me not: the pastors <07462> (08802) also transgressed <06586> (08804) against me, and the prophets <05030> prophesied <05012> (08738) by Baal <01168>, and walked <01980> (08804) after <0310> things that do not profit <03276> (08686).